(NaturalNews) "A mysterious bright light in the sky has sent Californians into panic," reports the BBC. "Videos posted online show a bright flare rising high, before a wide, bright blue flash emerges in a cone shape. Many videos continue to track the light for several minutes." The "official" explanation of this event -- and remember that "official" explanations are almost always cover stories -- is that the U.S. Navy launched a test missile just because they "routinely" test missiles. 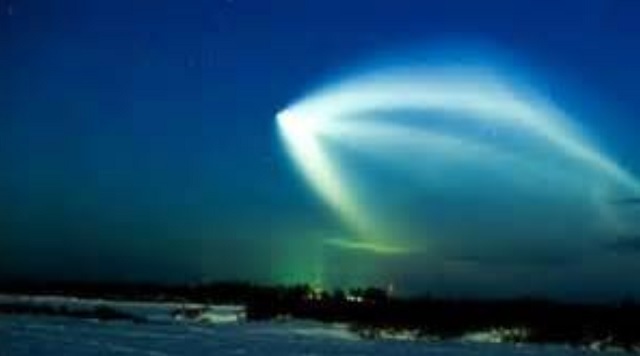 "Media in California confirmed that the light came from an unarmed Trident missile fired from the USS Kentucky navy submarine," reports the BBC. While they call the missile "unarmed," they fail to mention that the Trident missile normally carries a thermonuclear warhead. There's also no way for the media to know whether this missile was really unarmed or not, as the sole source on that question is the U.S. Navy itself. Apparently the media thinks the public is so incredibly stupid that they'll believe the U.S. Navy has nowhere else to launch a test missile other than right next to Los Angeles. Somehow we're supposed to believe the entire Pacific Ocean won't work for such a test launch, so they have to launch it adjacent to the airport and thereby inconvenience commercial aviation traffic for an entire week. Obviously, the official cover story is pure bunk. So what's the real story behind this? It all has to do with China and the covert war that's already underway between China, the US and Russia. Authored by Ronald O'Rourke, Specialist in Naval Affairs, and just released on Sep. 21, 2015, the report is entitled, "China Naval Modernization: Implications for U.S. Navy Capabilities." China is building a modern and regionally powerful navy with a limited but growing capability for conducting operations beyond China’s near-seas region. Observers of Chinese and U.S. military forces view China’s improving naval capabilities as posing a potential challenge in the Western Pacific to the U.S. Navy’s ability to achieve and maintain control of blue-water ocean areas in wartime -- the first such challenge the U.S. Navy has faced since the end of the Cold War. China’s naval modernization effort encompasses a broad array of platform and weapon acquisition programs, including anti-ship ballistic missiles (ASBMs), anti-ship cruise missiles (ASCMs), submarines, surface ships, aircraft, and supporting C4ISR (command and control, communications, computers, intelligence, surveillance, and reconnaissance) systems. China is fielding an ASBM, referred to as the DF-21D, that is a theater-range ballistic missile equipped with a maneuverable reentry vehicle (MaRV) designed to hit moving ships at sea. DOD states that China continues to field an ASBM based on a variant of the CSS-5 (DF-21) MRBM that it began deploying in 2010. This missile provides the PLA the capability to attack aircraft carriers in the western Pacific. 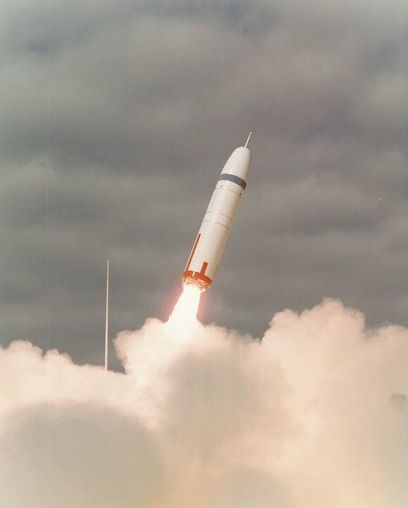 The CSS-5 Mod 5 has a range exceeding 1,500 km [about 810 nm] and is armed with a maneuverable warhead. 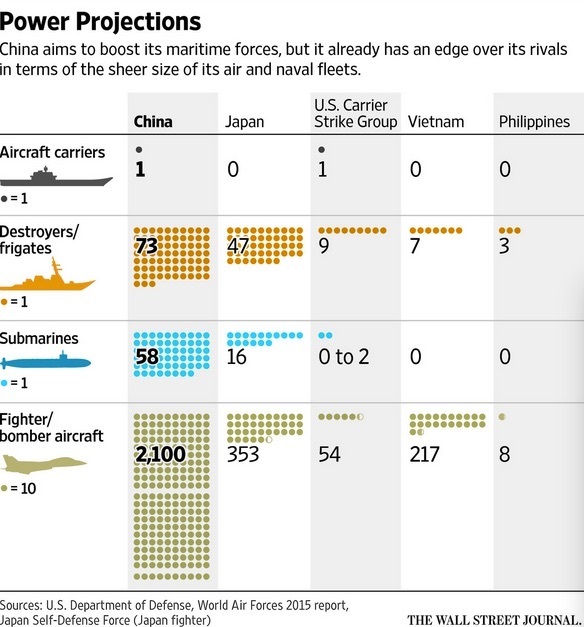 China, in other words, has weapons capable of destroying U.S. aircraft carriers, destroyers and other ships. The 1,500 km range is key because it allows a very wide operational range. The Russian and Chinese navies are set to hold their largest joint exercises ever, featuring scores of warships, hundreds of troops and an amphibious landing, in what appears to be a deepening of ties meant to counter a rising U.S. military presence in Asia. In September, Chinese warships were spotted operating near the coast of Alaska. This was reported across the mainstream media, including in the Wall Street Journal in an article entitled, "Five Chinese Navy Ships Are Operating in Bering Sea off Alaska." Fox News also covered the same story: "5 Chinese warships spotted off Alaska coast during President Obama's visit." In response to that territorial provocation, the U.S. Navy sent the USS Lassen destroyer to within 12 nautical miles of China's newly-constructed military bases in the Spratly Islands. China claims most of the South China Sea and on Oct 9 its Foreign Ministry warned that Beijing would "never allow any country to violate China's territorial waters and airspace in the Spratly Islands, in the name of protecting freedom of navigation and overflight." This is all on top of the Pentagon's secret space weapon attacks on China's industrial infrastructure. As I wrote on August 17 of this year, Natural News was informed by mainland Chinese dissidents that they believe the string of mysterious industrial explosions such as the massive Tianjin explosion was caused by kinetic strikes from orbital platform weapons operated by the United States. China then retaliated by covertly destroying a U.S. weapons depot in Tokyo, using old-school sabotage techniques. Two additional industrial explosions in China soon followed. China's war of aggression is also in high gear on the geopolitical side, with China pressuring Taiwan President Ma Ying-jeou to publicly state yesterday that Taiwan is now part of China! From Channel News Asia: "Taiwanese President Ma Ying-jeou emphasised the island must continue to uphold the 1992 Consensus with China’s Communist Party in order to promote cross-strait relations and development, as he marked the 22nd anniversary of the historic talks between Taipei and Beijing in Singapore." Taiwan is a critical strategic island for U.S. influence over the Pacific naval theater of operations. Taiwan's airports and military basis provide key strategic locations for staging U.S. aircraft and even bombers if conflict breaks out with China. As you ponder all this, keep in mind that Taiwan's media giants have all been infiltrated and taken over by communist China. The Taiwan media is now China's state-run media. Only small, independent websites can be trusted to report the truth. The U.S. Navy's "showcasing" of the Trident missile near Los Angeles is a $31 million billboard that tells China, "Don't f--k with us." Right now, the United States and China are in an undeclared state of war. China stands ready to strike the USA with nuclear warheads or high altitude EMP weapons that would destroy the U.S. power grid and cause 90% casualties across the unprepared population. Legendary American journalist Ted Koppel has even written a book about this entitled Lights Out: A Cyberattack, A Nation Unprepared, Surviving the Aftermath. Many people believe that China and Russia are working together to prepare for a massive first strike against the United States that would cripple its defenses and economy. Following that first strike, a land invasion would commence using Russian troops. Supporting this theory, Russian submarines have been spotted near undersea internet cables in an obvious effort to document their whereabouts so that the cables can be instantly severed, unleashing a devastating blow to the U.S. economy, Wall Street and even military communications. "Russian submarines and spy ships are aggressively operating near the vital undersea cables that carry almost all global Internet communications, raising concerns among some American military and intelligence officials that the Russians might be planning to attack those lines in times of conflict," reports WND.com. " In times of tension or conflict, the ultimate Russian hack on the United States could involve severing the fiber-optic cables at some of their hardest-to-access locations to halt the instant communications on which the West’s governments, economies and citizens have grown dependent." At the same time a new Russian "drone sub" has been created that can strike U.S. coastal cities and harbors with nuclear weapons. Writing on NationalSecurity.news, Jon Dougherty states, "According to officials, the developmental unmanned underwater vehicle, or UUV, when it is deployed, will be outfitted with megaton-class nuclear warheads that can destroy key ports used by U.S. nuclear-armed and powered submarines like Kings Bay, Georgia, and Puget Sound in Washington state." • A devastating currency war initiated by China announcing its own gold-backed currency while dumping U.S. Treasury debt on the open market. • China-led assault on U.S. Navy warships using anti-ship ballistic missiles (ASBMs). As all this is going on, the Obama administration -- a treasonous regime of criminals who have seized control of the U.S. government in an effort to destroy America from within -- has been firing all the top military commanders who know how to survive such an assault. Instead of America's military focusing on how to win wars, troops are now subjected to sensitivity training and the politically correct push for female troops on the front lines. This is not fiction. Even the U.S. White House is now openly preparing for a massive EMP attack launched by China. Congress has now heard testimony that the United States is not ready for World War III while Russia is chomping at the bit to “get it on”. Further Congress has learned that Obama has been once again been badly outmaneuvered by Putin, the master chess player... the Chinese and the Russians are going to kick America’s rear end in the upcoming war. TalkNetwork.com - the new talk radio network where I will be discussing this Trident missile launch during tomorrow's show. It airs at 11am Pacific / 2pm Eastern.